Happy birthday! 2017 marks 10 years of EcoTools and as I mentioned before, the brand has revamped their winning collection and added some pretty (and do-good) surprises to celebrate. And the official celebration piece is the Limited Edition Anniversary Collection that comes in a gorgeous (and very handy) rose gold circular tin. Airbrushed finish: duo fibre that works well with powder, creams and liquid foundation, to buff that base right in. Personally, I think this one could be a bit firmer but does a great job creating that foundation for the makeup. Controlled setting: tapered for precise highlighting and setting on cheekbones and brow arches. Angled crease: great for smoking, in any proportion; just to create a bit of definition and dimension of smoke away. Flat eyeliner: a hero for upper or lower lining that works a treat with powder, liquid and gel. Eye/Lip blur: so soft to diffuse shadows and liners. Great to blend harsh lines on eyeshadow, eye or lip liners. Spoolie: great brow and lash combing. The sturdy canister is great to protect brushes while in transit. And looks great on a dressing table. All brushes are super soft on the skin and have a bamboo handle with recycled aluminium ferrules and cruelty free bristles. This lovely EcoTools Limited Edition Anniversary Collection is available at Boots (with a buy 1 get 2nd half price on EcoTools*) and Superdrug (at the moment with a 3 for 2 on EcoTools*) for £19.99. And hurry because it’s limited edition, so be speedy! *Information correct at the time of publishing (21 May 2017). Cleaning my makeup brushes has always been torture to me. So much time is spent, it is a dull task that not even the feeling of a squeaky clean brush on your face is able to numb the pain. Add to that the fact I am a bit lazy busy and it is really the thing nightmares are made of. Did I mention I am a bit dramatic? No? Ok. When I first saw videos of the StylPro Makeup Brush Cleaner and Dryer, I knew that at some point I would get one, it was just a matter of time. Fast forward to Olympia Beauty, the fabulous yearly beauty trade show and there it was, staring me in the face and asking to come home with me. Although there was no discount on the £49.99 retail price, I got a bottle of their fab brush cleaner thrown in as a gift, which is a saving of £14.99. The device, another brainchild of the amazing (and lovely) inventor Tom Pellereau (from The Apprentice/Stylfile fame) is quite small and sleek. The different sizes brush holders will cater for most brands (I have many and there was one for every single brush I cleaned). Attaching is easy and quick, just what you want when changing between brushes. After swirling the brush around, rise it up a bit and let spin for a bit longer. This will fan the brush (which is what happens when it’s being cleaned anyway) and air it to dry, so not only your brush comes out clean, it’s also dry, pretty much ready to use again. Sometimes, as the brush fans out in the cleaning motion, which thoroughly cleans the inside bristles, it is difficult to clean the bottom of outside ones, which forms the outside of the brush; a bit of swirling around proves useful to get those parts clean. The only thing for me is that is only seems to work perfectly and quickly with the StylPro Makeup Brush Cleanser Solution, which is rather fabulous but at £15 a pop, quite steep. Overall, a lovely gadget for those looking to make their lives easier (me!) and make such a dull task a little bit of fun. You can buy the StylPro Makeup Brush Cleaner and Dryer from the Stylfile website, and it costs £49.99. And it will be available at 180 bigger Boots stores from the end of November! Mind you, the device is so popular that at the moment, you can pre-order for delivery which will start shipping in a few days time – that’s a common occurrence as this always sells out! 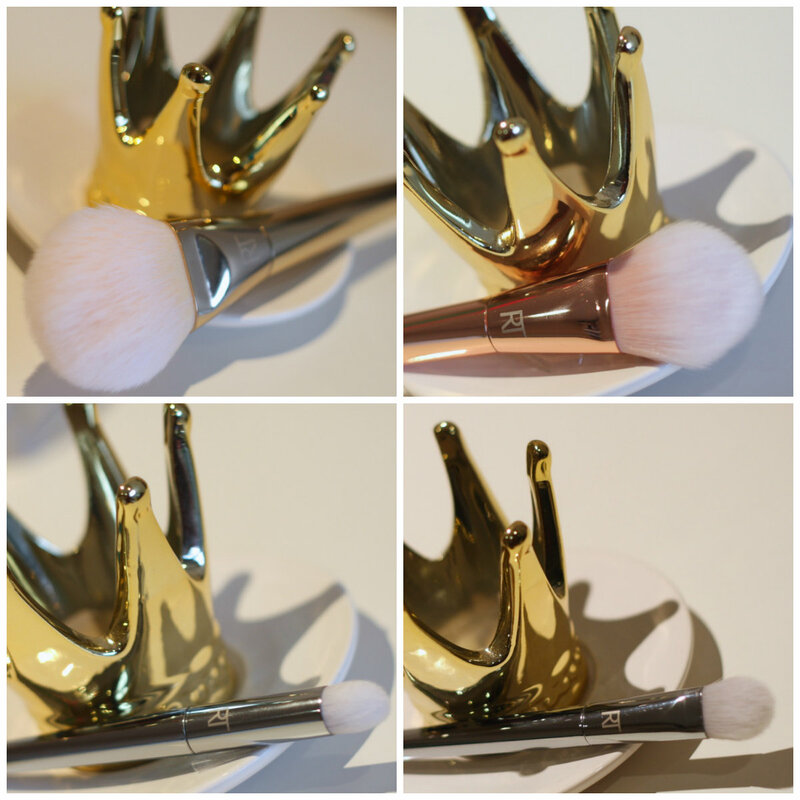 There was a lot of talk about the Real Techniques Bold Metals brushes. The main one was pricing, followed by their sheer prettiness. But how do they do the job? Eyeshadow lovers all over will agree that it is indeed a pain when you are using multiple colours on your lids and need to either clean the brush or use another one. Vera Mona Color Switch is a handy little tin that helps us with that. The Duo version, apart from cleaning the brush for the next colour, also has a “wet spot” in the middle, for wet eyeshadow application.